LEED certification is a certification process aimed at rewarding sustainable and environmentally friendly decisions that are part of your construction process. It is a way to demonstrate to you and your customers, that certain environmental goals have been achieved during the design and construction of the structure or facility that is being certified. To be certified, the building project needs to obtain certain points and meet green building standards that will, later on, be validated during the certification process. A LEED certified building can qualify to obtain specific state and local government incentives and can help boost press interest in your project. On November 2015, the latest certification process was based on LEED v4 system that is actualized from time to time, but be sure to verify with the USGBC the latest revision of the system before starting the certification process. It is very important to highlight that the rating system can be implemented in both, new construction and existing buildings. Location and transportation - You should take into consideration the location of your project and how it can be combined with the transportation option within the area, in other words how the users of the facility can get in and out of the facility. Materials and Resources- Earn credits by using sustainable and earth-friendly products, while reducing waste promoting better indoor air quality. Water efficiency - The building must be designed in such a way that potable water usage is reduced or resources can be reused, minimizing the needs of water inside the building. Energy and atmosphere - The building must enhance energy performance and promote great indoor air and environmental quality. Sustainable sites - Design the project in such a way that the natural resources and ecosystems nearby can naturally take part of the design minimizing environmental pollution. Indoor environmental quality - Increase daylight usage and promote natural ventilation. Innovation - Any idea that is not covered under the five LEED main areas. Regional priority credits - Addressing any particular concern based on the regional or geographical location. 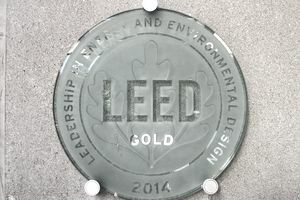 What Benefits Can You Obtain Through a LEED Certification? Promote the usage of recycled material.